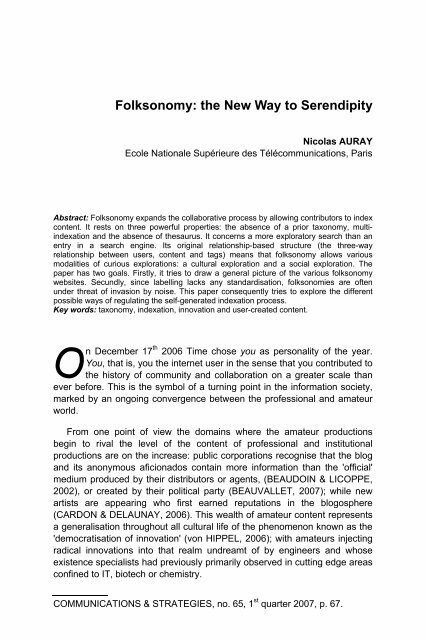 Folksonomy: the New Way to SerendipityNicolas AURAYEcole Nationale Supérieure des Télécommunications, ParisAbstract: Folksonomy expands the collaborative process by allowing contributors to indexcontent. It rests on three powerful properties: the absence of a prior taxonomy, multiindexationand the absence of thesaurus. It concerns a more exploratory search than anentry in a search engine. Its original relationship-based structure (the three-wayrelationship between users, content and tags) means that folksonomy allows variousmodalities of curious explorations: a cultural exploration and a social exploration. Thepaper has two goals. Firstly, it tries to draw a general picture of the various folksonomywebsites. Secundly, since labelling lacks any standardisation, folksonomies are oftenunder threat of invasion by noise. This paper consequently tries to explore the differentpossible ways of regulating the self-generated indexation process.Key words: taxonomy, indexation, innovation and user-created content.On December 17 th 2006 Time chose you as personality of the year.You, that is, you the internet user in the sense that you contributed tothe history of community and collaboration on a greater scale thanever before.  This is the symbol of a turning point in the information society,marked by an ongoing convergence between the professional and amateurworld.From one point of view the domains where the amateur productionsbegin to rival the level of the content of professional and institutionalproductions are on the increase: public corporations recognise that the blogand its anonymous aficionados contain more information than the 'official'medium produced by their distributors or agents, (BEAUDOIN & LICOPPE,2002), or created by their political party (BEAUVALLET, 2007); while newartists are appearing who first earned reputations in the blogosphere(CARDON & DELAUNAY, 2006). This wealth of amateur content representsa generalisation throughout all cultural life of the phenomenon known as the'democratisation of innovation' (von HIPPEL, 2006); with amateurs injectingradical innovations into that realm undreamt of by engineers and whoseexistence specialists had previously primarily observed in cutting edge areasconfined to IT, biotech or chemistry.COMMUNICATIONS & STRATEGIES, no. 65, 1 st quarter 2007, p. 67.